SharePoint is an important business tool that allows users to share and collaborate on content from any device. Teams and organizations can access team files, calendars, and news feed so that everybody knows what is new withing the company. The only issue with this tool is that it does not offer native support for all platforms. Luckily, Microsoft will soon fix this as the company is preparing to roll out its new SharePoint Mobile app for Windows, iOS and Android this quarter. SharePoint is used by more than 200,000 companies which translated into more than 190 million users. This tool is one of Microsoft most profitable apps, bringing billions to the company’s treasury. Taken into account Google’s plans to steal 80% of Microsoft’s business clients, the features offered by SharePoint will definitely be a strong argument in Microsoft’s favor. The first to get the new features are those using SharePoint Online. Some of these new features that are cloud-dependent won’t be rolled out to SharePoint on-premises, therefore there is a little difference in the app content depending on the app type. 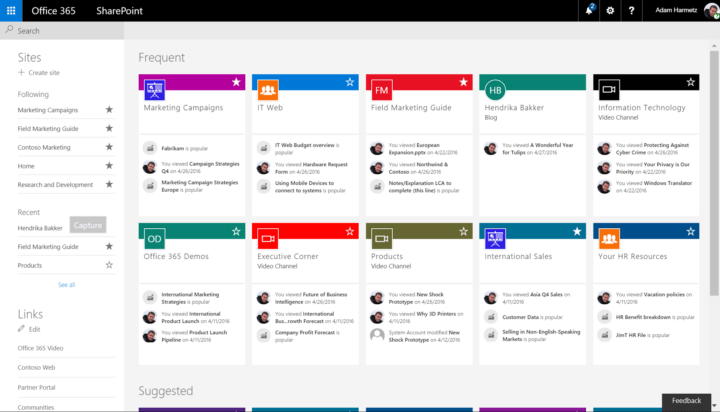 The new Sharepoint will encourage collaboration even more and will allow companies to better manage their teams.